Happy Back to the Future day! 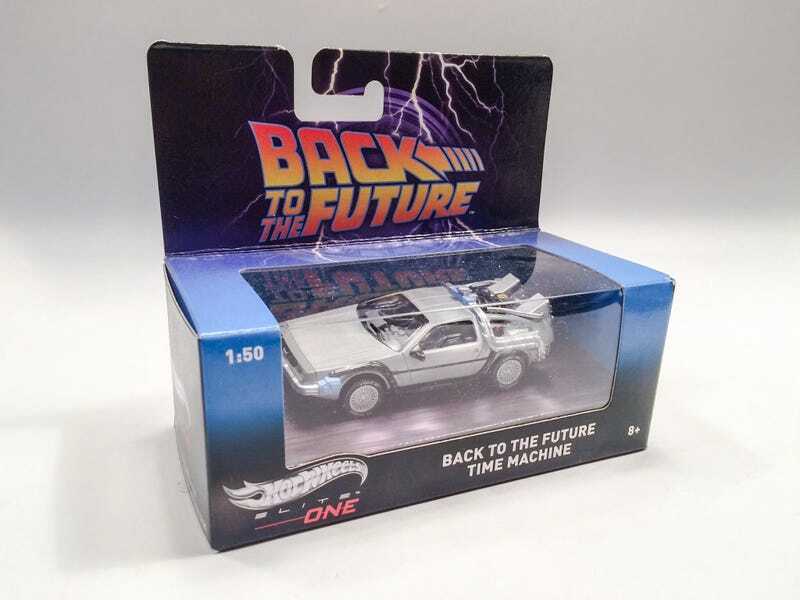 Today I’m cracking open this 1:50 scale Hot Wheels Elite One Back to the Future Time Machine Delorean DMC-12. I’m pretty sure this model has the longest official name of all the cars in my collection. This is a 1:50, so a little bigger than a Matchbox car, but smaller than a 1:43. (That’s some quick math, Sn210). It’s an interesting size, because its size both limits the details and also impresses. Not quite as detailed as a 1:43, but higher quality than a 1:64. Anyway, this model was an Xmas gift last year from everyone’s favorite Jeff, Jeff Simmons! I figured there was no better time to break it free than BTTF day. Let’s start with that legendary stainless finish. Hot Wheels did a great job of imitating the stainless steel body. The doors don’t open, but I imagine that would be difficult to pull off on a Delorean this small. This sucker’s nuclear? Clearly we have the time machine from the first movie, since there’s no Mr. Fusion and no white walls. We’ve got all of the space-time-continuum goodness here. Hot Wheels did an excellent job capturing all of the major external components to make 1.21 jiggawatts. The wheels leave a little to be desired. The tires are rubber and tready and awesome. But those iconic Delorean wheels just seem kind of, flat? I feel like the spokes should be taller, tighter, and the dead space in between should have been blacked out. Overall, I love this little model. I’m a big fan of the Delorean in general, so naturally BTTF is one of my favorite movies. A 1:18 time machine wouldn’t fit in with the rest of my collection, so this little 1:50 is perfect!